A Sunshine Coast directory of Sechelt Bed and Breakfasts, Vacation Homes and Cottage Rentals. Sechelt BC is located on the spectacular Sunshine Coast of BC and just a short 30 minute drive from Langdale, where you arrive by BC Ferries from Horseshoe Bay BC. 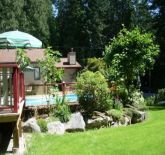 Private Bed & Breakfast Guest House surrounded by mature trees and a park-like setting on the beautiful Sunshine Coast, British Columbia. Enjoy your favourite beverage on the pool deck or take it to the beach just steps away. Start your day with a delicious full-course breakfast in our Tuscany-style dining room or a deluxe continental breakfast in your suite. Call Rosemarie's at 1-604-885-7307 to book your stay! Enjoy this spectacular private executive guest house on your next visit to Sechelt. Wakefield Guest House is located just a few minutes north of Sechelt BC, and is walking distance to Wakefield Beach. Visit Wakefield Guest House's Website or Email to book your stay. This is a fabulous Sechelt Vacation Rental, 5 stars. Check the website or call for availability. If you are seeking a B&B in another Sunshine Coast community, refer to the Bed and Breakfast listings in the other Service Directories pages from the Sunshine Coast BC homepage.